Gold golf emblem image on cover. Available for 4x6 horizontal photos only. Smooth finish, lightweight white paper stock. Side-load construction. Availability: Requires 5 business days production time before shipping. 2 pack (50 folder) minimum. No returns or exchanges. Add To Cart to view ship rates and delivery dates. 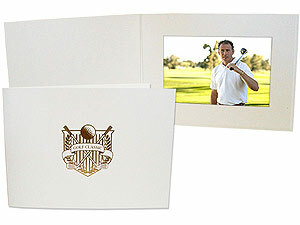 This Golf Emblem Photo Folder is great for any golf outing or tournament. Use as is or add custom text below the emblem. You can also add your company logo to the inside or back cover for a corporate golf event. Photo Frame Opening Size: 3-5/8" x 5-5/8"